No matter how much I keep hoping these boys will stop growing so fast, each year seems to come and go, flying by faster than the last. 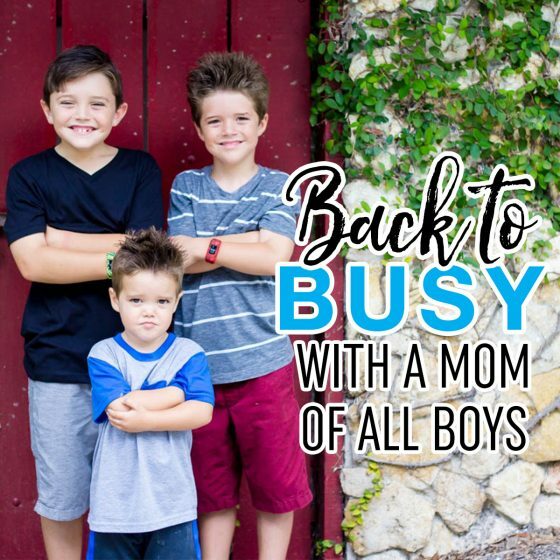 As a full-time working mom of three active and energetic boys, the hustle and bustle of getting ready for a new school year has already begun. Between soccer sign-ups, school supply shopping, and a baby on the way, this year is going to be exciting and busier than ever as my oldest enters 2nd grade, my middle child heads to kindergarten, and the youngest begins his adventures into the realm of extracurricular activities… oh yes, not to mention the new addition arriving in February. Trying to keep track of everyone’s schedule – school and extracurricular activities – while working full-time, making three healthy, organic, and edible meals for five people a day, and getting anywhere on time requires patience, planning, and a lot of preparation. That said, it is always fun and exciting to jump into a new school year watching my boys thrive socially and academically while discovering the joy that comes from learning. 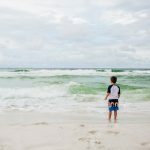 The lazy days of summer allowed us a more lenient schedule, and although we still had to get out the door every day, it was a good 45 minutes later than during the school year. 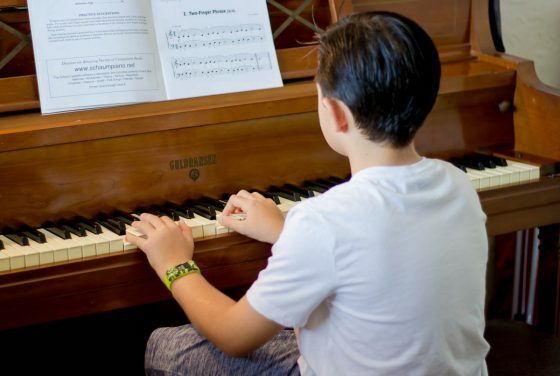 Most of the kid’s after-school or extracurricular activities also end for the summer, but back-to-school also means back-to-soccer, chess club, and homework, with a continuation of gymnastics, golf, and piano lessons. I was spoiled for a long time because the Montessori pre-school and kindergarten the boys attended since the age of one was literally just blocks from my house. Last year, when my oldest began attending a public school, and one further away because he is in a gifted program, I had to become much more timely, which I will admit is not my strong suit. I am a morning mama, but I can always find “just one more thing” I need to do before we walk out the door. 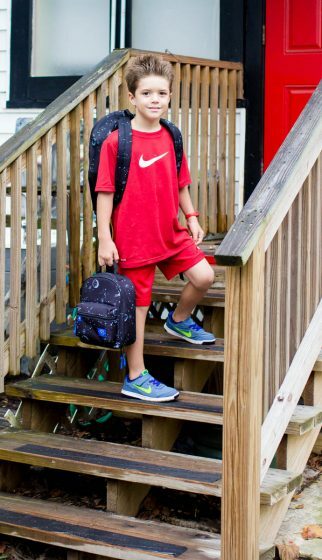 When it comes to school drop off however, I still have it easy because my independent little men all love their schools, carry in and put away their own gear, lunch boxes, and backpacks, and easily kiss me goodbye before running off to play with their friends. 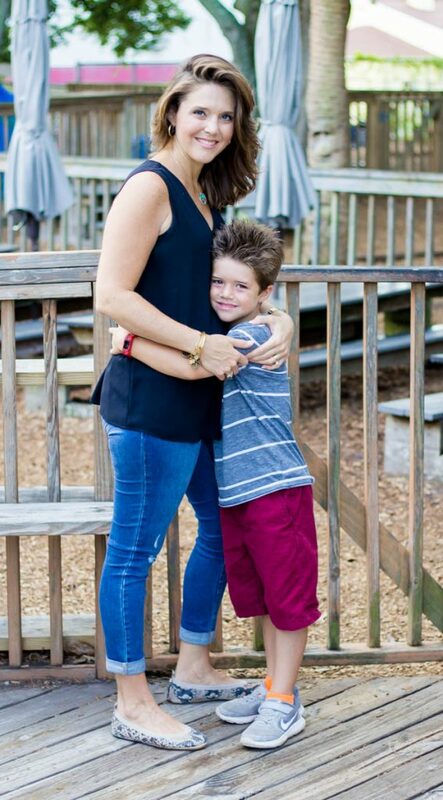 Being constantly on the go, on my feet, and now pregnant, I believe one of the best fashion creations for busy mom’s out there is the ballet flat. Wearing high heels all day is tough enough in a professional environment, but at drop off and pick up on a playground (of mulch), much less on a soccer field for evening practice, heels are simply impractical. For working moms out there, flat shoes are a must-have because it is simpler and quicker to hop in and out of the car, especially when you have to stop at multiple schools before making it to the office. 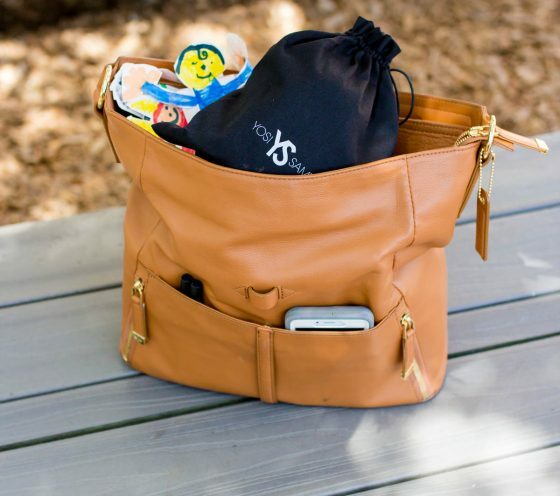 Having the ability to toss a pair of ballet flats in a bag so you aren’t constantly losing one shoe makes for super simple, on-the-go changes for Mom. Switching from your flats to heels for work and back to flats for pick up and the evening’s agenda has never been easier or more stylish, and I strongly suggest picking a neutral pair of shoes that goes with everything for the greatest of ease. If you are anything like me, then you also need to find a comfy, cute pair of shoes that won’t irritate your sensitive skin or fall apart after the first accidental splash in a rain puddle. Further, I tend to stick with the familiar, and so I prefer a pair of shoes I can wear for casual Friday, a day out with the kids, or with my professional work attire. 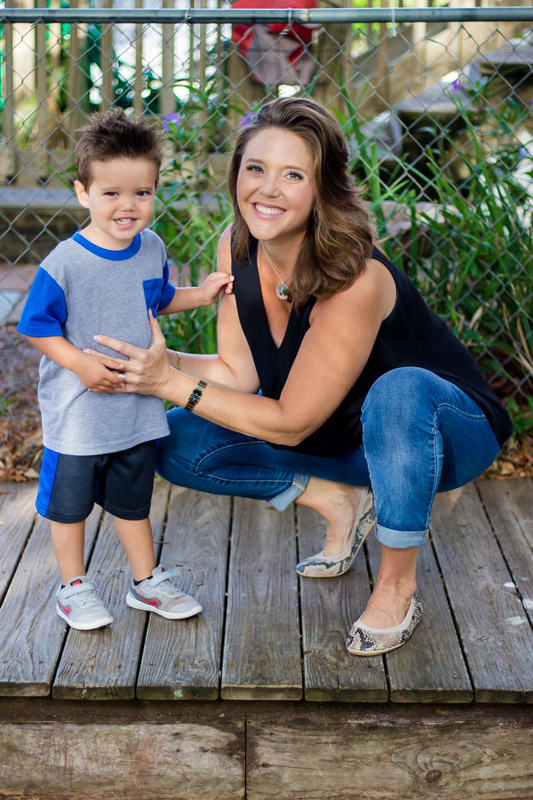 Trust me, from one busy mom to another, your feet and back will thank you for grabbing a new pair of quality ballet flats, especially when you are chasing your 2-year-old around a soccer field! 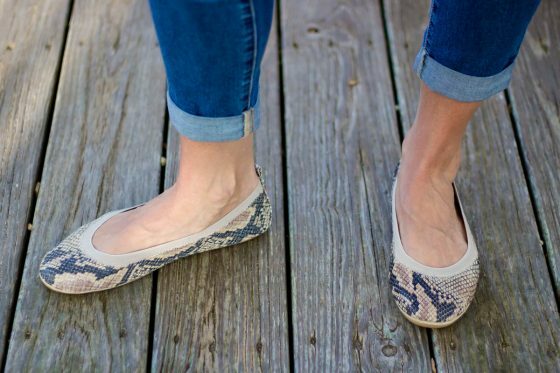 I love the Samara 2.0 Beige Serpent Ballet Flats that come with a convenient tote for these fold and go flats. These shoes are not only easy to carry with you all day, they are also comfortable with enough padding in the heel to prevent the pain or discomfort that sometimes comes with wearing a flat shoe. The Beige Serpent is a mixture of blacks and tans, allowing these shoes to complement almost any outfit, professional or casual. With a soft leather upper and a super cushioned sole, this classic ballet flat will become the go-to shoe for you this fast-paced school year. Speaking of soccer, sports, and all the extracurriculars we will have going on this fall, keeping track of my boy’s activity has become an important goal of mine. With my 2nd grader attending a public school gifted program with very rigorous academics, I often fret about his amount of physical activity throughout the day. Unfortunately, our public schools don’t give much recess, and the children only attend a P.E. class once a week. That said, for my once very energetic and active child, he now tends to sit and spend more time reading or working on an iPad than I would prefer. 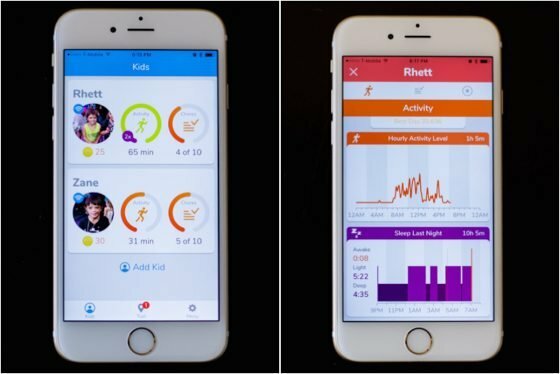 After doing a bit of research and discovering a kid-friendly fitness tracker however, I am excited for the tracking and record-keeping of both his and his kindergarten age brother’s activities this school year, with even a few extra additions for goal setting, chore charting, and allowance. 12.7 million children in the United States are overweight or obese. Behaviors that influence excess weight gain include not getting enough physical activity and sedentary activities such as watching television or other screen devices, along with sleep routines. 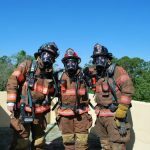 Obese children are more likely to suffer from high blood pressure and high cholesterol, which can lead to cardiovascular disease, type 2 diabetes, asthma, sleep apnea, joint problems, and fatty liver disease. Childhood obesity is also related to anxiety, depression, low self-esteem, and social problems such as bullying. 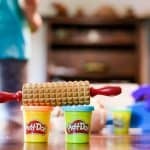 Children suffering from obesity are more likely to become obese adults, and their disease risk factors in adulthood are likely to be more severe. 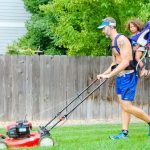 As a parent, I am trying to instill in my boys responsibility for their chores, their choices, and their bodies. Meaning I want my children to learn from an early age the true value of exercise, healthy eating, and fulfilling one’s expectations. 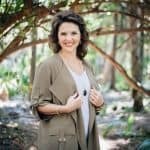 I refuse to be the parent who constantly nags my teenagers to complete basic tasks, so I am trying my hardest now to instill some of those ideals in my kids, so by the time they are a little bit older these behaviors – staying fit, doing homework, personal hygiene – are all simply second nature. The Garmin Vivofit Jr. is a children’s fitness tracker complete with a long-lasting battery and a parent-controlled app. 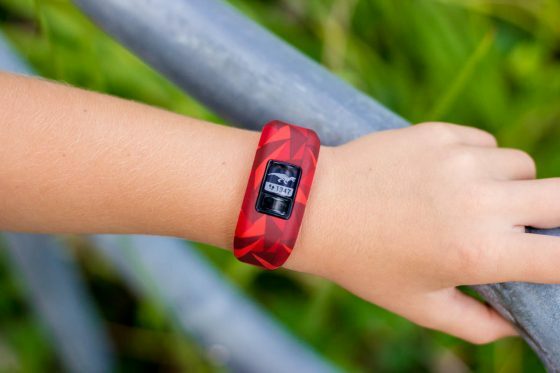 This kid-friendly, water resistant device has some cool capabilities any parent will love. 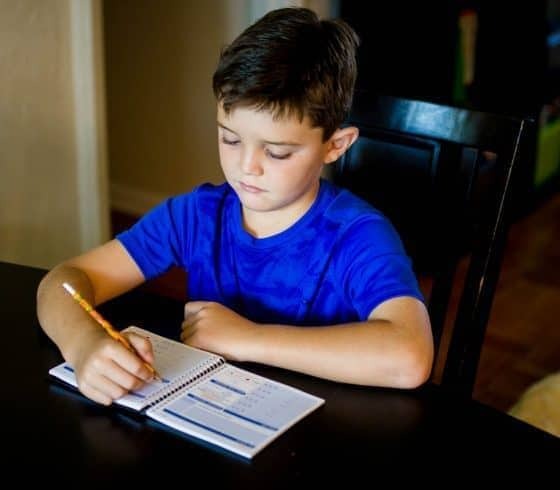 From tracking my children’s physical activity, to sleep patterns, to chores, this fitness tracker allows me to see what the boys are doing, set timers, goals, and chores, and encourages them to move around and complete their tasks in order to earn rewards, and reveal new animals and fun facts. All their progress is then sent to my cellphone via Bluetooth. 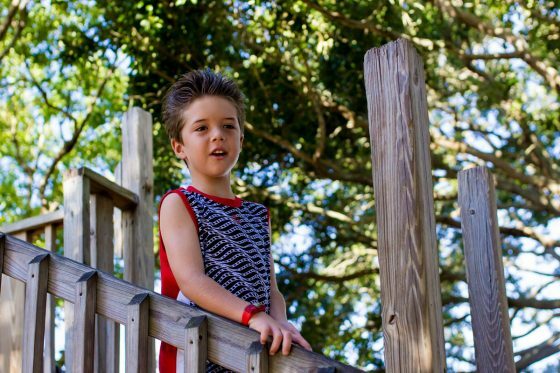 The Garmin Vivofit Jr. allows me to start instilling healthy habits and expectations in my boys at an early age, all while making this lifestyle fun and exciting for them. As parents, my husband and I both follow relatively strict, paleo type diets. His is for medical reasons and mine is simply because after completing a Whole 30 a year ago, I felt like a new person and have loved the renewed energy and focus I believe I have gained since deciding to stick to a more paleo/Whole 30 inspired lifestyle. 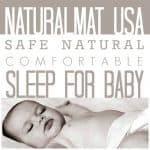 That said, the boys all eat very healthy with breakfasts, lunches, and dinners all being prepared at home with organic or all-natural ingredients, but they are permitted much more leeway than the adults. Sunday is for meal planning and prepping, and I spend a lot of extra time in the kitchen that day making lunches for the week as well as snacks and dinner. With a busy schedule that keeps us out of the house all day at work, school, and extra-curricular activities, meal planning and preparation is key to having healthy weeknight dinners. Between the automatic oven option on my cooktop, the Crockpot, and the Instant Pot, we get the luxury of sitting down to dinner every night while our boys regale us with tales of their always exciting school days. I am a firm believer that a technology-free, family dinner as often as possible, preferably nightly, is an essential component to raising great kids. I think the time, prayer, and conversation spent together from a young age instills family values with an emphasis on open and honest communication that will continue to benefit my boys as they get older. As my 2nd grader is away from home making more independent decisions when it comes to both food and physical activity at school, we are working with him on making healthier choices and how and why they will impact his lifestyle. This doesn’t yet apply to my 5 and 2-year-olds as the Montessori school they attend has MUCH more outdoor playtime, a huge playground, and a learn through play philosophy. 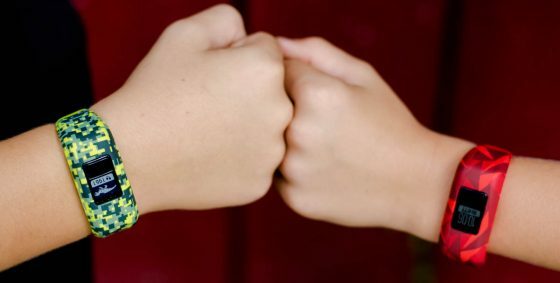 In line with healthy goal setting and fitness tracking, we wanted to implement a reward system for the oldest to begin truly valuing his own health and wellness. To be honest, he attends after-care at school and the snacks they were serving the children were problematic for me. Aside from having little to no nutritional value and being chock-full of awful ingredients, my son would come home and not be hungry for dinner until bedtime. I pack lunch for the kids every day, and so by the end of the last school year my son and I made a deal that if he would simply eat the healthy extra snack I would send in his lunchbox rather than the food served at extended day, he would get a reward or treat on the weekend. This year, in anticipation of this same situation, I began searching for a solution that would allow me to reward him for his healthy choices. 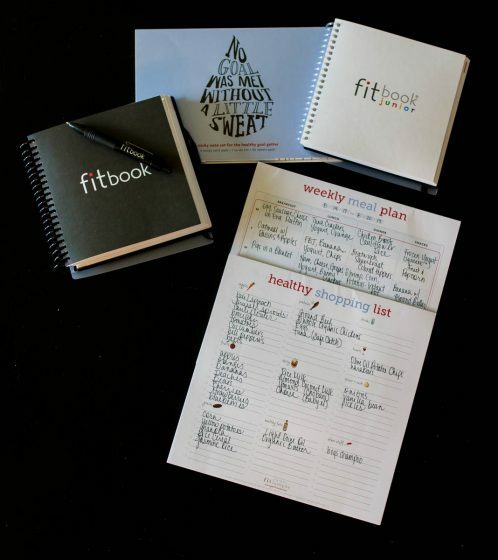 The Fitbook FamPack is an awesome tracking/recording and journaling plan that comes with both an “adult” and a junior version to inspire both parents and kids to live life fit. 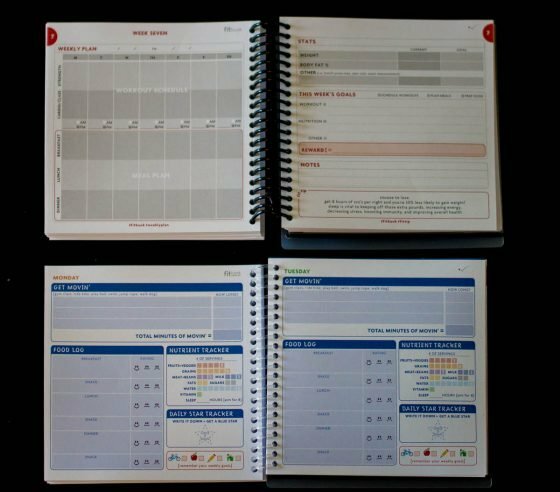 The standard adult fitbook allows you to track your food choices, nutrition stats, body measurements, and exercise plan along with making notes and setting goals. Similarly, the fitbook junior allows your child to set both daily and weekly goals, keep a food log, track how many servings of the different food groups he’s eaten daily, and set long term goals. 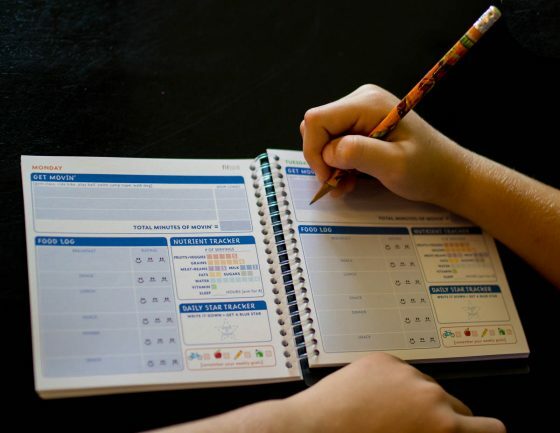 With stickers to track your child’s accomplishments, a coach’s guide, and ideas to get your child moving, this pint-sized planner packs a punch when teaching your child important lessons about fitness, nutrition, and discipline. 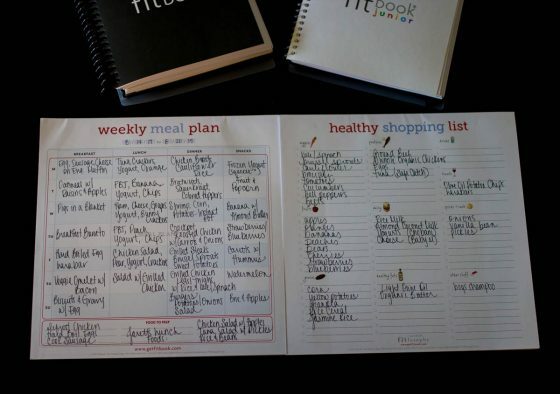 Fitbook’s “fitlosophy” is to live life fit, and in keeping with the journaling and planning that I am encouraging in my son I will also be using their shopping list and weekly meal planner this school year to stay organized and on track with our family’s food choices. 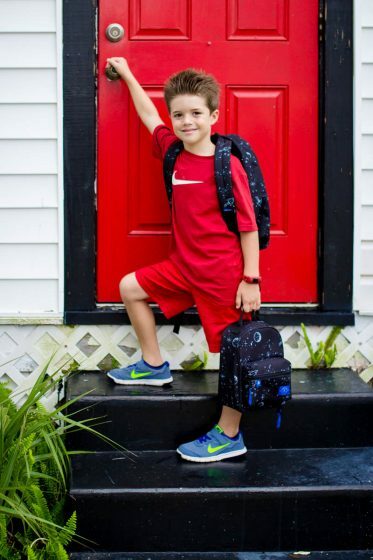 Although my middle son will remain at his Montessori School through Kindergarten just as his older brother did, there are still some changes that come with entering Kindergarten. In the morning he now has to be to school on-time and ready to work because he will have responsibilities he must fulfill each and every day. At the beginning of each week he will be given his personalized clipboard with his “assignments” for the week which he needs to complete. 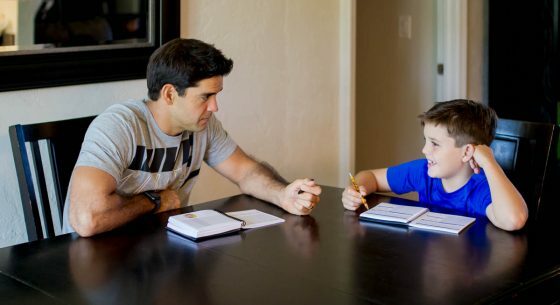 A big difference is that he will also have a weekly homework assignment, occasional projects and a nightly reading log to be brought home, completed and returned. For the pre-school age children, the school does not allow backpacks for each child. There is simply not the storage space and the kids each have a cubby to hold their personal belongings and a file folder for all of their artwork and papers that they can check daily or weekly. The school does not provide lunch so each child does bring a lunchbox everyday. Kindergarteners however are expected to bring backpacks and have special hooks in the kitchen of the school just for their bags. That said, this is my five-year-old’s first year to pick out his own backpack along with some additional school supplies, such as a folder and binder, which are for his personal use rather than for the community or classroom. As the mother of all boys one thing I always look for is QUALITY. I cannot emphasize that enough. From sneakers to backpacks, lunchboxes to shorts, quality and durability are always huge factors in my book. Admittedly I have no idea who other than a young boy uses the toes of his sneakers as brakes or the front pockets of his backpack as his personal rock/stick/cicada shell museum, but I can tell you the true test of just about anything is how it holds up in the hands of a little boy. 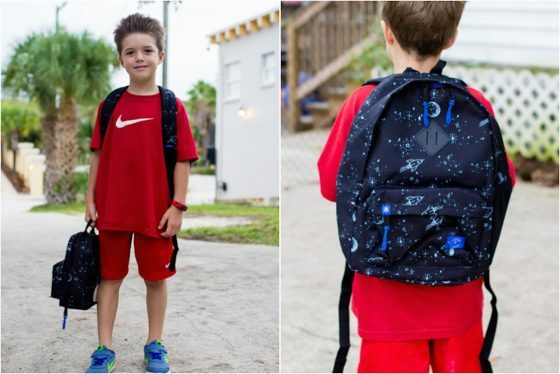 This school year, we chose the Parkland Bayside Backpack as the optimal carry-all for Kindergarten. 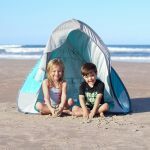 Designed specifically for younger students, the Bayside is just the right size for their growing body, featuring a roomy interior perfect for folders, a binder and a pencil case, but not so large as to ride too low or fall off their shoulders. 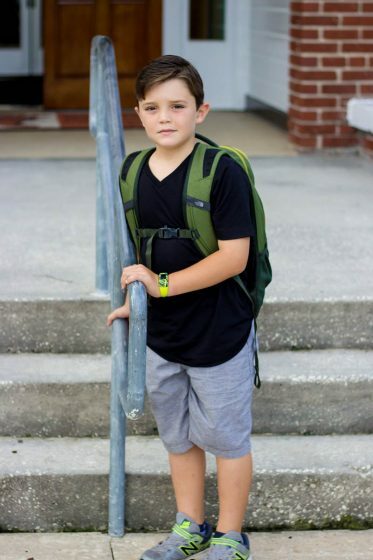 With an exterior power mesh water bottle holder and a front pocket perfect for headphones, snacks or bug exoskeletons your child will be ready for school or an outdoor adventure in comfort and style. 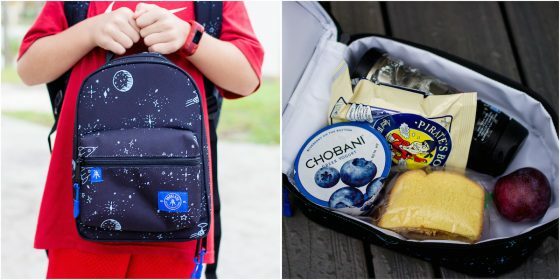 As I pack lunches everyday as well, the Parkland Space Dreams Rodeo Lunch Kit was an instant favorite for its tough exterior and lightweight style. 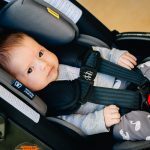 With an insulated, easy-to-clean interior and a front zip snack pocket, your child can fit plenty of food, including warmed or chilled items, to keep those little brains healthy and active throughout the day. With plenty of matching patterns to choose from the Bayside Backpack and the Rodeo Lunch Kit are sure to be a hit with any elementary school-aged child. 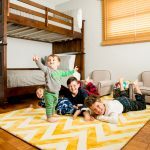 Although we may not get much downtime, especially during the week, having some special, educational materials for the boys to build, play, and create with is always important to this Montessori Mama. Particularly for my 5 and 2-year-old, having a lesson just for them while the oldest brother works on homework is essential to keeping their attention, keeping the TV off, and keeping them entertained so I can bounce between all three boys and put the finishing touches on dinner. With the two older boys recently interested in coding and robotics, but the 2 year-old still struggling with some of the concepts and tiny pieces, the discovery of a Montessori-approved coding lesson for younger children was amazing! 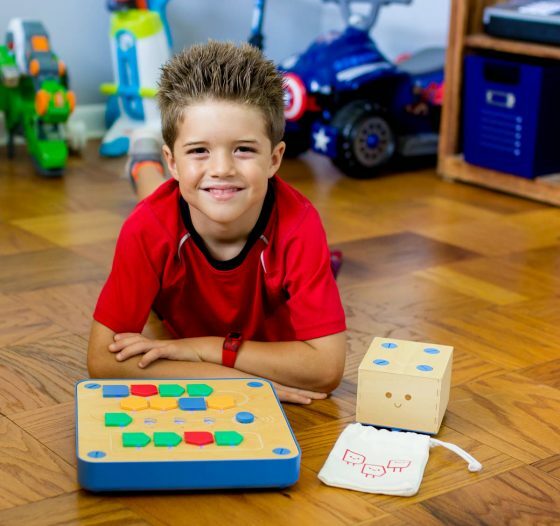 Cubetto promotes coding for little hands without screens. This wooden robot is programmed using large color-coded pieces snapped into place on a wooden control board to tell the robot where to go. 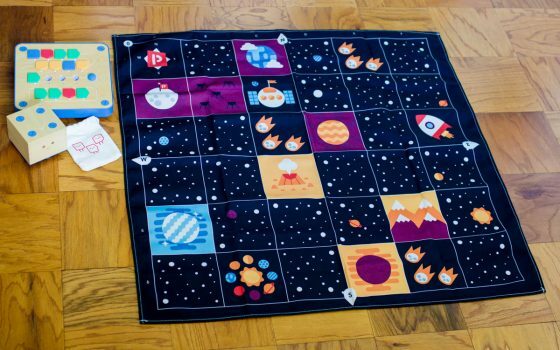 With large, heavy-duty playmats, Cubetto can be made to follow storylines or world maps, taking your child on creative adventures all while working on their early STEM skills without a computer, iPad, or tablet. This engaging activity promotes gender-neutral play that boosts creativity, critical thinking, spatial awareness, and communication skills. 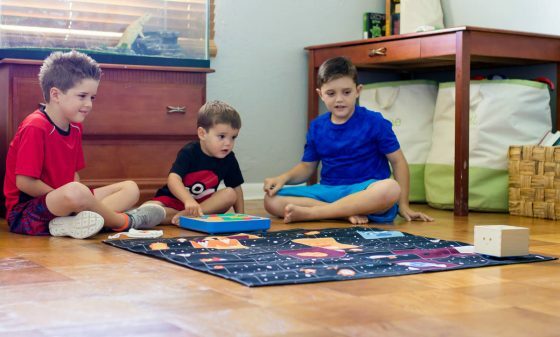 Allowing the boys to learn to operate Cubetto through trial and error was an instant favorite. Because the large pieces are so simple for little hands to manipulate on the wooden programming board, there were no tiny pieces resulting in frustration or tears when an alteration needed to be made. 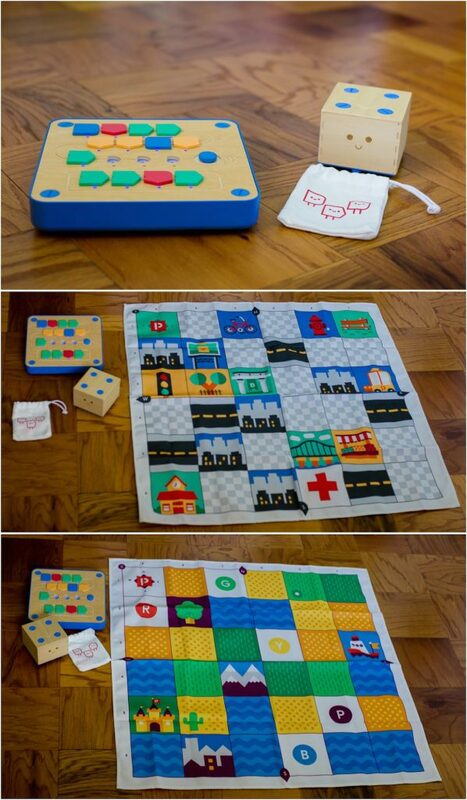 The sequencing and patterns that emerge when working with Cubetto encourage children to keep playing to see where they can make him go next and how to best get him to their desired location. Further, both the 5 and 2 year-old’s excitement over the fact that they could “tell” the robot where to go by placing pieces on the board and without actually touching “Cubetto” (the robot) was priceless, and kept them entertained and engaged indoors and without a screen! Heading back to school is always an exciting time for the boys, even though we are not really home during the summer, because friends come back to school, new teachers are introduced in the next classroom, and soccer picks up again where they have many friends from other schools. 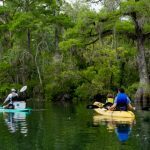 For this Florida Mom, it signifies at least somewhat cooler weather (eventually), upcoming holidays, and a variety of seasonal social gatherings. Although busy and without much free-time, this is how our family thrives, and we love spending quality time with each other, our extended family, and many friends throughout the school year. For more back to school inspiration and ideas, check out The Supreme Back to School Guide.